View More In Boat Fenders. 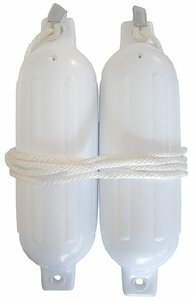 Acting as a cushion and preventing damage to your boat's hull and topside, these rotomolded UV-resistant vinyl fenders with sturdy ribs provide lasting durability. Inflation valve allows for adjustment to desired level of firmness, while twin eye design enables fenders to hang vertically or horizontally for attachment to a deck cleat, dock or piling. Includes two inflatable fenders and matching 3/8 inch x 5 foot polypropylene double-braided fender lines. SeaChoice is committed to delivering quality marine accessories and OEM replacement parts to satisfy fishing, boating and watersports enthusiasts worldwide. SeaChoice is run for and by boaters offering a wide-ranging product line while remaining affordable.